Hand-Crafted. Women-Owned and Operated. Fair Trade. Designed with laughter and love in Santa Fe, New Mexico. Twitten handknits aren’t just one thing: they’re Whimsical, Urban, Casual Country. Cozy après-ski, Romantic & Fun… They’re for people who say “I love hearts!” and for people who say, “I hate hearts!”. Twitten LLC is 100% women-owned and operated. The entire Twitten® Line is Fair Trade and Handcrafted in Peru by artisans whose work supports and sustains traditional communities. For one of our fingerless glove lines, Jennifer Isaacson (Head Twittenista) travels to the small Andean village of Chinchero in the Sacred Valley of Incas 15 miles from Cuzco. 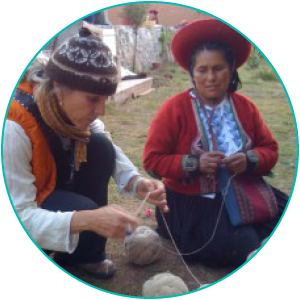 In Chinchero Jen teaches a young women’s cooperative how to make products suitable for the U.S. market. This is a way to keep cultural traditions alive while expanding commercial opportunities. The women of Chinchero vote on every job they choose to take on. They were particularly excited when they started working with Jennifer because, for the first time, their work would be sold in the U.S market. Last year they began to sell the styles we developed with them directly through their new Coop Store in Cusco. This store caters predominantly to tourists en route to Machu Pichu. Incidentally, the price that TWITTEN charges for the Chinchero line is a pass-through price – all profits go to the women’s coop. So while we don’t make an actual profit on these items, working with the women is rewarding and our way of giving back to the community in Peru. 20% of all profits go to the Bodhi Fund. When 4 year old Bodhi was diagnosed with a rare form of leukemia, his family knew it would be a tough battle. What made it more challenging was that the treatment Bodhi needed was not available in New Mexico. He and his family went to a medical center in New York City for life-saving treatment. Today he’s a healthy, happy teenager. 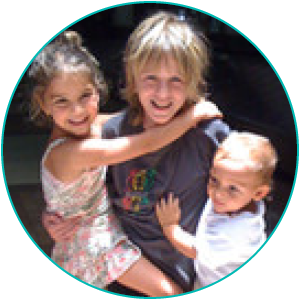 In honor of his positive experience and in order to help other families navigate the challenges of seeking out-of-state treatment for their children, Bodhi’s family established the Bodhi Fund. Managed by NMCF, the Bodhi Fund provides financial aid to cover living expenses, including mortgages, utilities and car payments, when families are plunged into emotional and financial crisis. The fund is designed to cover all New Mexico children who are diagnosed with rare cancers or blood diseases and require out-of-state treatment. Since the fund’s inception, no grant applicant has been denied. The majority of New Mexico children with oncological and blood diseases travel to Children’s Hospital Colorado, a center of excellence in Denver, for out-of-state treatment. Doctors there express great admiration for the Bodhi Fund, and wish they had a fund such as this. Keep the ripple effect going and help New Mexicans thrive — donate directly to the Bodhi Fund. Peru. Where doing business is an adventure. And a joy. High in the Andes, a grandma is knitting for you. Peruvian handicrafts today have evolved from the tremendous creative output of the native population in the Andes since pre-Columbian times. 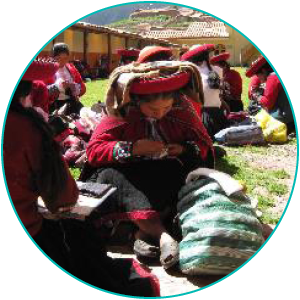 The majority of our line is produced by women in Puno. 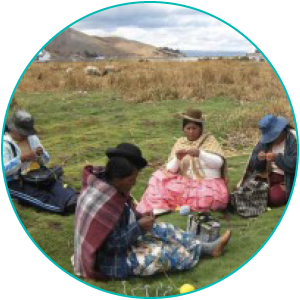 These expert knitters work outdoors on the shores of Lake Titicaca at an elevation of 12,500 feet. The yarns they use -100% Alpaca or a blend of Alpaca, Wool and Synthetic- are made in Arequipa (elev. 7,600 ft.).